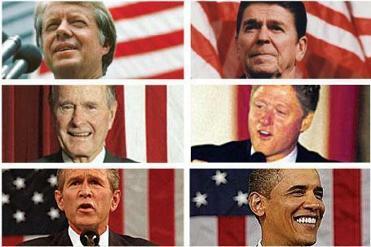 Our creaky, 30-year-old vision of America’s role is ripe for an overhaul from the next president. 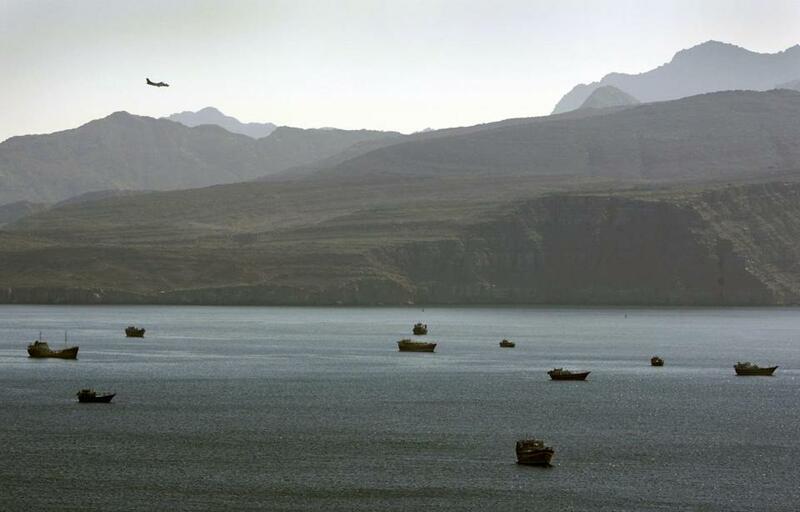 AMERICA’S ADOPTED NEIGHBORHOOD: A plane flies over the mountains south of the Strait of Hormuz. Cops say they figure out a suspect’s intentions by watching his hands, not by listening to what comes out of his mouth. The same goes for American foreign policy. Whatever Washington may be saying about its global priorities, America’s hands tend to be occupied in the Middle East, site of all America’s major wars since Vietnam and the target of most of its foreign aid and diplomatic energy. Lurking behind the debate over tactics and approach, however, is a challenge rarely mentioned. The broad strategy that underlies American policy in the region, the Carter Doctrine, is now more than 30 years old, and in dire need of an overhaul. Issued in 1980 and expanded by presidents from both parties, the Carter doctrine now drives American engagement in a Middle East that looks far different from the region for which it was invented. President Jimmy Carter confronted another time of great turmoil in the region. The US-supported Shah had fallen in Iran, the Soviets had invaded Afghanistan, and anti-Americanism was flaring, with US embassies attacked and burned. His new doctrine declared a fundamental shift. Because of the importance of oil, security in the Persian Gulf would henceforth be considered a fundamental American interest. The United States committed itself to using any means, including military force, to prevent other powers from establishing hegemony over the Gulf. In the same way that the Truman Doctrine and NATO bound America’s security to Europe’s after World War II, the Carter Doctrine elevated a crowded and contested Middle Eastern shipping lane to nearly the same status as American territory. The consequences have been profound. Every conflict in the Gulf since (and there has been a constant supply) has involved the United States. Our Navy patrols its waters, in constant tension with Iran; our need for bases there has persuaded us to support otherwise noxious leaders. The Carter Doctrine has driven the US fixation on stability among Arab regimes and Washington’s micromanagement of Israel’s relations with its neighbors. The entire world enjoys the same oil prices when they’re low and stable, but the United States carries almost all of the increasingly unsustainable cost of securing the Gulf. As difficult as it can be to imagine a fresh approach to such a complex web of alliances and conflicts, the next administration will enjoy a tool that Carter lacked: the insights gained from three decades of sustained, intimate, and often frustrating direct involvement in the region. Hundreds of thousands of American combat troops have done tours in the Middle East, diplomats and politicians have deeply involved themselves in US policy there, and Washington has spent billions of dollars in the process. In 2012, we look back on a recent level of American engagement with the Middle East never seen before. Even the failures have been failures from which we can learn. The decade that began with the US invasion of Afghanistan and ended with a civil war in Syria holds some transformative lessons, ones that could point the next president toward a new strategy far better suited to what the modern Middle East actually looks like—and to America’s own values. President Carter issued his new doctrine in what would turn out to be his final State of the Union speech in January 1980. America had been shaken by the oil shocks of the 1970s, in which the Arab-dominated OPEC asserted its control, and also by the fall of the tyrannical Mohammad Reza Pahlavi, Shah of Iran, who had been a stalwart security partner to the United States and Israel. Nearly everyone in America and most Western economies shared Carter’s immediate goal of protecting the free flow of oil. What was significant was the path he chose to accomplish it. Carter asserted that the United States would take direct charge of security in this turbulent part of the world, rather than take the more indirect, diplomatic approach of balancing regional powers against each other and intervening through proxies and allies. It was the doctrine of a micromanager looking to prevent the next crisis. Carter’s focus on oil unquestionably made sense, and the doctrine proved effective in the short term. Despite more war and instability in the Middle East, America was insulated from oil shocks and able to begin a long period of economic growth, in part predicated on cheap petrochemicals. But in declaring the Gulf region an American priority, it effectively tied us to a single patch of real estate, a shallow waterway the same size as Oregon, even when it was tangential, or at times inimical, to our greater goal of energy security. The result has been an ever-increasing American investment in the security architecture of the Persian Gulf, from putting US flags on foreign tankers during the Iran-Iraq war in the 1980s, to assembling a huge network of bases after Operation Desert Storm in 1991, to the outright regime-building effort of the Iraq War. In theory, however, none of this is necessary. America doesn’t really need to worry about who controls the Gulf, so long as there’s no threat to the oil supply. What it does need is to maintain relations in the region that are friendly, or friendly enough, and able to survive democratic changes in regime—and to prevent any other power from monopolizing the region. The Carter Doctrine, and the policies that have grown up to enforce it, are based on a set of assumptions about American power that might never have been wholly accurate. They assume America has relatively little persuasive influence in the region, but a great deal of effective police power: the ability to control major events like regional wars by supporting one side or even intervening directly, and to prevent or trigger regime change. Our more recent experience in the Middle East has taught us the opposite lesson. It has become painfully clear over the last 10 years that America has little ability to control transformative events or to order governments around. Over the past decade, when America has made demands, governments have resolutely not listened. Israel kept building settlements. Saudi Arabia kept funding jihadis and religious extremists. Despots in Egypt, Syria, Tunisia, and Libya resisted any meaningful reform. Even in Iraq, where America physically toppled one regime and installed another, a costly occupation wasn’t enough to create the Iraqi government that Washington wanted. The long-term outcome was frustratingly beyond America’s control. When it comes to requests, however, especially those linked to enticements, the recent past has more encouraging lessons. Analysts often focus on the failings of George W. Bush’s “freedom agenda” period in the Middle East; democracy didn’t break out, but the evidence shows that no matter how reluctantly, regional leaders felt compelled to respond to sustained diplomatic requests, in public and private, to open up political systems. It wasn’t just the threat of a big stick: Egypt and Israel weren’t afraid of an Iraq-style American invasion, yet they acceded to diplomatic pressure from the secretary of state to liberalize their political spheres. Egypt loosened its control over the opposition in 2005 and 2006 votes, while Israel let Hamas run in (and win) the 2006 Palestinian Authority elections. Even prickly Gulf potentates gave dollops of power to elected parliaments. It wasn’t all that America asked, but it was significant. Declaring the Gulf region an American priority effectively tied us to a single patch of real estate—even when it didn’t help our greater energy goals at all. Paradoxically, by treating the Persian Gulf as an extension of American territory, Washington has reduced itself from global superpower to another neighborhood power, one than can be ignored, or rebuffed, or hectored from across the border. The more we are committed to the Carter Doctrine approach, which makes the military our central tool and physical control of the Gulf waters our top priority, the less we are able to shape events. The past decade, meanwhile, suggests that soft power affords us some potent levers. The first is money. None of the Middle Eastern countries have sustainable economies; most don’t even have functional ones. The oil states are cash-rich but by no means self-sufficient. They’re dependent on outside expertise to make their countries work, and on foreign markets to sell their oil. Even Israel, which has a real and diverse economy, depends on America’s largesse to undergird its military. That economic power gives America lots of cards to play. The second is defense. The majority of the Arab world, plus Israel, depends on the American military to provide security. In some cases the protection is literal, as in Bahrain, Qatar, and Kuwait, where US installations project power; elsewhere, as in Saudi Arabia, Egypt, and Jordan, it’s indirect but crucial. (American contractors, for instance, maintain Saudi Arabia’s air force.) America’s military commitments in the Middle East aren’t something it can take or leave as it suits; it’s a marriage, not a dalliance. A savvier diplomatic approach would remind beneficiaries that they can’t take it for granted, and that they need to respond to the nation that provides it. The Carter Doctrine clearly hasn’t worked out as intended; America is more entangled than ever before, while its stated aims—a secure and stable Persian Gulf, free from any outside control but our own—seem increasingly out of reach. A growing, bipartisan tide of policy intellectuals has grappled with the question of what should replace it, especially given our recent experience. One response has been to seek a more morally consistent strategy, one that seeks to encourage a better-governed Middle East. This idea has percolated on the left and the right. Alumni of Bush’s neoconservative foreign-policy brain trust, including Elliott Abrams, have argued that a consistent pro-democratic agenda would better serve US interests, creating a more stable region that is less prone to disruptions in the oil supply. Voices on the left have made a similar argument since the Arab uprisings; they include humanitarian interventionists like Anne-Marie Slaughter at Princeton, who argue for stronger American intervention in support of Syria’s rebels. Liberal fans of development and political freedoms have called for a “prosperity agenda,” arguing that societies with civil liberties and equitably distributed economic growth are not only better for their own citizens but make better American allies. While the realists think we should disentangle from the region because the US can exert strategic power from afar, others say we should pull back for moral reasons as well. That’s the argument made over the last year by Toby Craig Jones, a political scientist at Rutgers University who says that the US Navy should dissolve its Fifth Fleet base so it can cut ties with the troublesome and oppressive regime in Bahrain. America’s military might guarantees that no power—not Iran, not Iraq, not the Russians—can sweep in and take control of the world’s oil supply. Therefore, the argument goes, there’s no need for America to attend to every turn of the screw in the region. What’s clear, from any of these perspectives, is that the Carter Doctrine is a blunt tool from a different time. It’s now possible, even preferable, to craft a policy more in keeping with the modern Middle East, and also more in line with American values. It might sound obvious to say that Washington should be pushing for a liberalized, economically self-sufficient, stable, but democratic Middle East, and that there are better tools than military power to reach those aims. In fact, that would mark a radical change for the nation—and it’s a course that the next president may well find within his power to plot. He is an Ideas columnist.